Geomorphic Assessment - Fitzgerald Environmental Associates LLC. 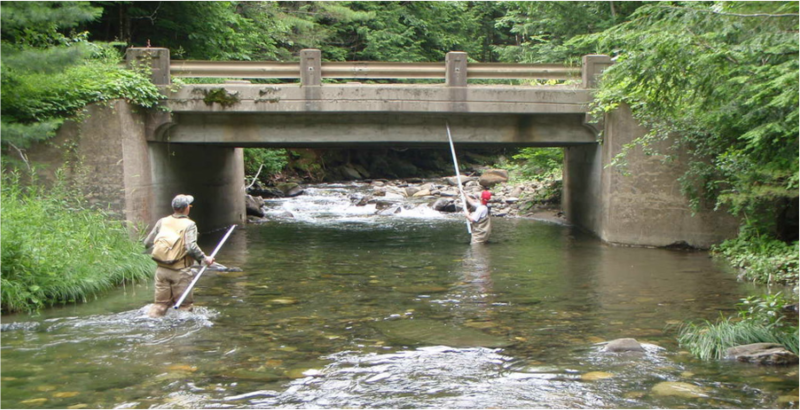 FEA has extensive experience with stream geomorphic assessment projects throughout Vermont. We have completed Phase 1 assessments on over 530 miles of river channel, Phase 2 assessments on over 390 miles of channel, and have produced 15 river corridor plans. In 2012 the Caledonia County Natural Resources Conservation District (CCNRCD) and the Vermont Department of Environmental Conservation (VTDEC) identified tributaries to the Lower Passumpsic River in northeastern Vermont for assessment of fluvial geomorphic conditions. Severe flooding and erosion damage sustained during 2011 flood events in the Towns of Danville and Lyndon led to the selection of five tributaries (Joe's Brook, Water Andric, Sleepers River, Sheldon Brook, and Wheelock Brook) for further study. Infrastructure along the tributaries was severely impacted by flooding and erosion, and the completion of Phase 1 and 2 stream geomorphic assessments and a river corridor plan will help the towns better understand existing flood vulnerabilities, and plan for future improvements with flood risks in mind. Fitzgerald Environmental Associates, LLC. (FEA) was retained by CCNRCD in 2012 to complete river assessments on five tributaries and six sub-tributaries in the Lower Passumpsic watershed following the Phase 1 Stream Geomorphic Assessment (SGA) Protocols developed by the VTDEC. FEA used the Stream Geomorphic Assessment Tool (SGAT) to develop the baseline GIS data for the watershed in 2012 and 2013. A total of 68 reaches along 48.5 river miles were assessed during the Phase 1 analysis. Full Phase 1 data, FIT, and windshield survey data were collected by FEA for five tributaries and six sub-tributaries. Following this study, a subset of the Phase 1 reaches was selected for field-based, Phase 2 SGA data collection. FEA completed the Phase 2 field work in 2013 for 36 reaches (approximately 25 river miles), and developed a River Corridor Plan (RCP) for these reaches. FEA developed a list of 85 potential stream corridor restoration projects within the study watersheds. The Town of Rupert is nestled in a narrow valley within the steep mountains of the Taconic Range in southwestern Vermont. The mountainous terrain draining the White Creek/Mill Brook watershed creates fluvial erosion hazards throughout the town. Over the last 20 years, Rupert has experienced numerous floods that have caused severe damage to private and public land and infrastructure. 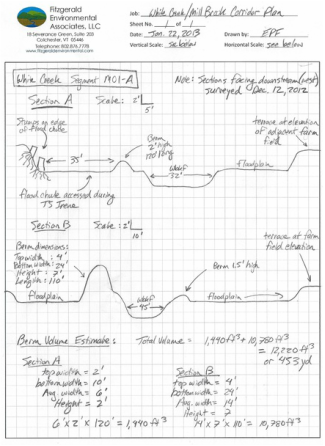 In an effort to understand the root causes of stream channel instability and fluvial erosion hazards in the White Creek/Mill Brook watersheds, the Bennington County Conservation District (BCCD) has worked to develop a database of Stream Geomorphic Assessment (SGA) data for most stream reaches of significant size in the watershed. In early 2012, BCCD received a grant from VTANR (Ecosystem Restoration Program) to develop a River Corridor Management Plan for the Mill Brook/White Creek watershed. Fitzgerald Environmental Associates, LLC (FEA) was hired by BCCD in spring of 2012 to develop the plan. FEA worked with BCCD and local stakeholders to develop a list of 29 potential stream corridor restoration projects. BCCD and the local steering committee reviewed these projects and selected five (5) high-priority sites to be researched in further detail. The projects included aquatic organism passage improvements at stream crossings, and channel/floodplain restoration (see sketch). Evan Fitzgerald presented the results of the corridor planning project to the Town in March, 2013. The White River drains a 712 square mile watershed spanning 30 towns in 5 counties. Numerous towns are found within its alluvial valley and along its steep banks, including the Town of Sharon. In 2009, the Town of Sharon White River Task Force and the Two Rivers-Ottauquechee Regional Commission (TRORC) sought to collect geomorphic and habitat data for the White River and its tributaries within Sharon for the purposes of adopting a Fluvial Erosion Hazard (FEH) overlay district within the town’s Flood Hazard Bylaw, and addressing habitat degradation concerns. FEA was selected through a competitive bid process to complete SGA Phase 2 assessments and river corridor planning for the study area covering 30 river segments (23.5 miles), including the White River main stem and four significant tributaries in the town. FEA also utilized the VTANR Rapid Habitat Assessment Protocol (VTANR, 2008) and Culvert Screening Tools to identify and prioritize restoration projects for the watershed’s salmonid fishery. FEA developed a data template to display the results of the habitat assessments in graphical formats. The recommendations will be used by the project partners to prioritize culvert retrofits and river corridor easements to improve and protect spawning habitat in the tributaries. The Phase 2 SGA data were used for the development of FEH zones for that were adopted into the Town of Sharon zoning bylaws in 2010. Evan Fitzgerald presented the results of the assessment and planning effort in March, 2010 to multiple stakeholders and municipal officials from the Town of Sharon.